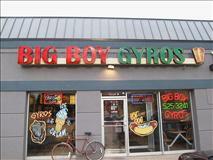 Big Boy Gyros, a family owned and operated restaurant since 1997 in the Roscoe Village/North Center area of Chicago. Serving homemade Greek, Mediterranean and American food at reasonable prices with friendly service. We’d like for you to stop by and enjoy our outstanding Gyros, Shish-Ka-Bob, Greek Salads, Italian Beef, Burgers, Hot Dogs and many other dishes. Don’t forget our desserts, ice cream and shakes. We offer delivery services and a extensive party menu too!